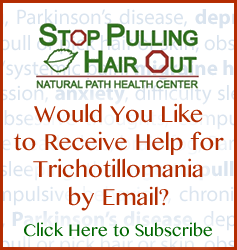 Trichotillomania is a disorder that involves the recurrent, often irresistible urges to pull hair out from your scalp, eyebrows, eyelashes or other areas of your body despite trying to stop. Pulling hair out from the scalp often leaves bald spots, which can cause significant distress and interfere with social, work and school functioning. People with trichotillomania (hair pulling disorders) will often go to great length to disguise their hair loss and often pull hair out only in private and generally try to hide their hair pulling from others. This often results in few or no one knowing about their disorder and can lead to a sense of isolation and guilt. Repeatedly/compulsively pulling hair out, typically from the scalp, eyebrows and eyelashes, but it can be from other areas of the body, including the arms, legs, armpits and pubic areas. An increased sense of tension before pulling hair out and if you try to resist pulling hair out. A sense of pleasure, relaxation or relief after pulling hair out. Pulling out specific types of hair (i.e., coarse, shiny, thick, thin, etc. ), having rituals that direct pulling hair out or having patterns of hair pulling. Playing with or biting pulled-out hair. Many people that have trichotillomania may also pick their skin, bite their nails are chew on the lip or inner cheek. Sometimes trichotillomania (hair pulling disorder) also manifests as pulling hair out from pets or dolls, or picking at clothes, blankets or other people. Trichotillomania (hair pulling disorder) is a long-term/chronic disorder, although symptoms can vary in severity over time. For many people, the urge to pull hair out is due to a neurotransmitter imbalance that can be corrected through the use of targeted amino acid therapy. Thanks for contacting us, although I apologize for my extremely delinquent reply – we seem to have had an issue with our website and I just now received your post. I would be happy to speak with your daughter; just have her contact us and we’ll get her set up for an initial consultation: http://naturalpathhealthcenter.com/contact-us/.